How does one go about requesting the declassification of ALL documents on a specific topic? I am not talking about the release of documents. Say 5,000 documents were released through FOIA, that would obviously be very costly unless the request comes from an agency that qualifies for a fee waiver. Are there other ways to have the documents declassified and released to NARA, upon request by a third party (say me)? Is there a process to get the ball rolling? Re: How does one go about requesting the declassification of ALL documents on a specific topic? You can find information about NARA and Declassification here on our website. The site contains information about and links to a variety of declassification related topics. You may also find some helpful information on the NDC's website. For information about NARA and Freedom of Information Act (FOIA) requests, you can view our FOIA Reference Guide here. This guide includes general information about FOIA requests as well as instructions on how and where to make a request for records in the custody of the National Archives. As noted in the guide, all FOIA requests must be submitted in writing, and "[a]ll FOIA requests must include a reasonable description of the records requested. In making your request you should be as specific as possible with regard to names, titles, dates, places, events, subjects, recipients, or agency component(s) or offices likely to maintain records that are of interest to you. The more specific you are about the records or types of records that you want, the more likely it will be that NARA will be able to locate those records." If the records you would like to request are in the custody of another agency (or other agencies), you will need to submit your FOIA request to that agency (or to each other agency individually). These other FOIA resources may help you with that process. Included, for example, is a link to principal FOIA contacts at other agencies. Thanks but that didn't answer my question. That is a tough task to get accomplished. There could be 100's of linear feet, and classifications at various levels. the NRO, National Reconnaissance Office. The PIDB makes recommendations toward classification and declassification procedures. These are utilized when drafting Executive Orders. A MDR falls within the EO, category. I also watched the NARA Youtube Chief FOIA Officers Meeting. It was very informative. The FOIA teams should be trying to focus the FOIA, and agencies should be participating in Proactive Disclosure, and placing records online for public review in an electronic format. inattentive to public affairs, you and I, and Congress and Assemblies, judges and governors would all become wolves." Declassification of ALL the records on a specific topic, would rely on the nature of the topic and the interest of the public. Another consideration would be, yes it Can be done, but Should it be done. Maybe, it would be better to just exist within the pack? You said, "In my opinion, the best route would be for legislative and executive action." Since these document may relate to the CURRENT national security of the United States, I'm going to shoot off an e-mail to the Adm. Scott Swift, commander of U.S. Pacific Fleet. If my argument is strong enough, is there a chance in hell he might actually declassify all documents related to the Pueblo Incident? If you think you could help accomplish this, contact me directly. Here's the tentative cover of my book. 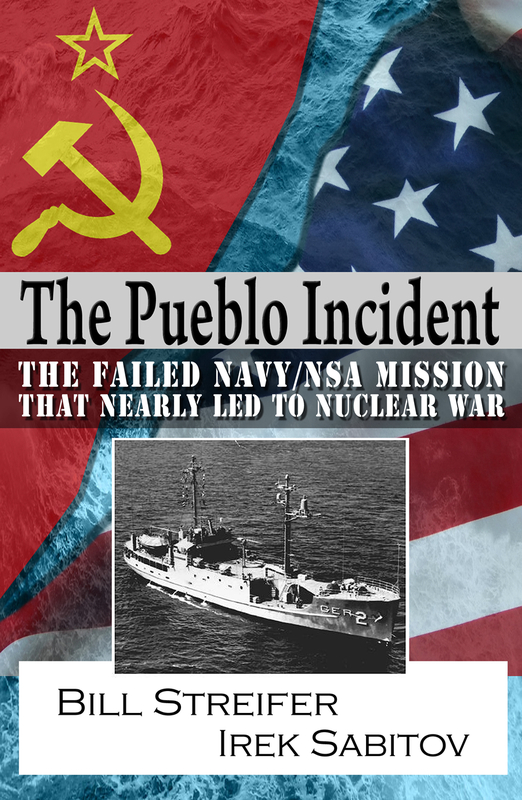 Perhaps The NRO, and Navy still have documents pertaining to the Pueblo? I received a response today from CETCOM that they had no further SF135 Records pertaining to Desert Storm. So the majority of Desert Storm records are in the custody of NARA. There could be some others still at other agencies. Ask the Navy if they still retain any Pueblo records? They released the actual fly over photos of the Pueblo capture. The route was most likely tracked. The 1st Korean War, resulted in Macarthur being relieved for his tactical plan to use atomic weapons. I have a number of FOIA requests in the works with Navy Historical. One of their FOIA officers called me today. Let me quote him when I told him what I found ... "Wow! Unbelievable!!" (I may be paraphrasing) But in a follow-up e-mail, he thanked me for letting him know what I obtained from the CIA, NSA, and other places. the JFK records which were released by legislation. I saw another NARA Youtube video of the FRC, Federal Record Center in the limestone caves, whereby they digitize the documents for other agencies, such as the Army Corps of Engineers. Some Agencies seem to have their own system. The video shows the digitation process. It seems that many records may be digitized before they are even sent to NARA. They also use E-Discovery tools, and electronic redaction which may simplify the process of declassification. public. The Open Meetings and Federal Register are open for public comments. I think it would be great to disclose more records to the public in an electronic format. But the FOIA Improvement Act of 2016 did not provide extra funding and staffing for it. The Electronic Portal is funded. The portal will eliminate redundancy. Such as declassifying records twice, with different redactions. It will also eliminate the unjust issue of records for profit, whereby others can view and download them from the portal. In many cases, the logistic issue of a thousand cans of beans, or grenades may not be needed during the research. A focused and specific FOIA for the Joint Command records or Unit Chronology may suffice. accession numbers that may have further textual records. the younger generation wants quick, user friendly facts. By definition, classified documents are classified. In my particular situation, documents declassified between 2010-2016 remain heavily redacted. If I don't know what these redacted and declassified documents concern, how can I know which documents to request? course in the past, and never had a problem? The majority of the interpreters were fluent in Russian, perhaps there was a contingent of Russian advisors. The former Soviet Union also used various language and dialects from obscure regions. Similar to the US during WW2. There was also a U2 recon plane overheard that photographed the entire capture. The photos have been released. information will only be released to One publisher or motion picture company as to create books and movies for all the customers? If this is the case, then the information may be sanitized and merely released for profit? Maybe the Motto should just be, "Release to All"? This is a very good NARA Youtube Video concerning the NDC National Declassification Center Process. certain classes of records draw more attention, such as an intel source verses a logistic source. They also mentioned that the records are electronically scanned and sent to the agencies with equity. the use of chemical weapons during WWI, atomic testing during WWII and the Cold War, and biological testing involving the SHAD Project in the 1960's, and the use of defoliants in Vietnam. The design classification seems to become confused with the actual test phase , deployment and use of special weapons on the battlefield? This video provides insight toward the thought process of declassification.